Why has golf become popular among Asians? 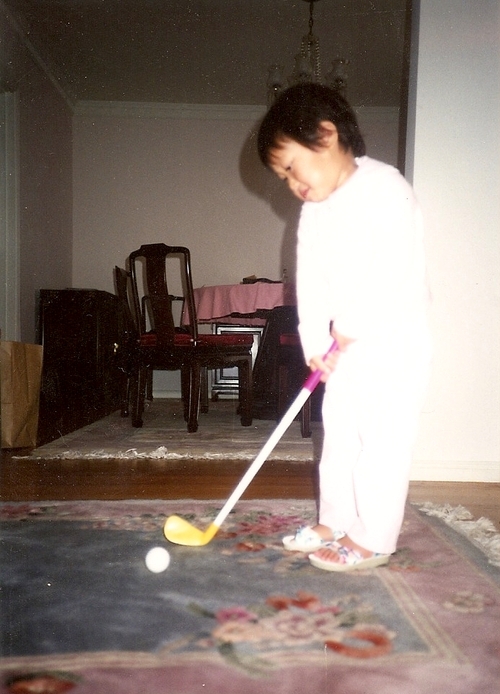 17 years ago, my dad slid my first golf club in my hand, a heap of hollow plastic made by Fisher Price. As an avid golfer, my dad wanted to ensure that I got an early start at the game that would supposedly bring me all the success and joy in the world. At ten, I had already begun taking formal lessons from the Pro, ranked 6th Best Teaching Professional in California, at my parents' golf club. By 14, my parents had pushed me to quit playing soccer, my favorite sport and activity at the time, to focus on golf in high school. The rationale was that I was "too short" and "not big enough" to ever make it on a good college soccer team and that I had much more potential and a better chance to play on a college golf team or to possibly even go Pro. So I quit my soccer team, began taking lessons from an even better instructor, joined my high school's golf team, played in individual tournaments all-year long, and quickly became engulfed in this intense and stressful lifestyle. Not to mention that tiny other aspect of getting good grades in school. Nonetheless, I followed my parents wishes and eventually came to Brown to play golf. After six long years of playing competitive golf, I realized that I had never enjoyed this sport to begin with and decided to quit. I haven't touched a club since and it has been the best decision I have ever made. After researching various other topics for this project, I realized that I have already had first hand experience with a very common theme in many Asian and Asian American households. Do well in your extracurriculars, get good grades, and go to an excellent college. There is a tremendous amount of pressure on children of these families to achieve, achieve, achieve and strive for success, success, success. The objective of my project is to exemplify this theme through golf, investigate how golf became a sport of choice among Asian and Asian American families, explain the reaction of others towards Asian women in golf and analyze the effects on Asians.